Pulse width BaseXIO (Asynchronous I/O, enhanced trigger) Defines the minimum or maximum width that a trigger pulse must The BaseXIO option offers 8 asynchro- have to generate a trigger event. Pulse width can be combined with nous digital I/O lines on the base card. channel trigger, pattern trigger and external trigger. The direction can be selected by software in groups of four. This allows e.g. exter- Multiple Recording nal equipment control or status monitor- The Multiple Recording ing. Two of these lines can also be used as additional external mode allows the recording of trigger sources. This allows the building of complex trigger conjunc- several trigger events with an tions with external gated triggers as well as AND/OR conjunction extremely short re-arming of multiple external trigger sources like, for example, the picture time. The hardware doesn’t and row synchronisation of video signals. In addition one of the need to be restarted in be- I/O lines can be used as reference clock for the Timestamp counter. tween. The on-board memory is divided in several segments of the same size. Each of them is filled with data if a trigger event occurs. Star-Hub Pre- and posttrigger of the segments can be programmed. The num- The star-hub is an additional ber of acquired segments is only limited by the used memory and module allowing the phase sta- is unlimited when using FIFO mode. ble synchronisation of up to 16 boards in one system. Indepen- Gated Sampling dent of the number of boards The Gated Sampling mode there is no phase delay be- allows data recording con- tween all channels. The star- trolled by an external gate hub distributes trigger and signal. Data is only record- clock information between all boards. As a result all connected ed if the gate signal has a boards are running with the same clock and the same trigger. All programmed level. In addi- trigger sources can be combined with OR/AND allowing all chan- tion a pre-area before start nels of all cards to be trigger source at the same time. The star-hub of the gate signal as well as a post area after end of the gate signal is available as 5 card and 16 card version. The 5 card version can be acquired. The number of gate segments is only limited by doesn’t need an extra slot. the used memory and is unlimited when using FIFO mode. 271 synchronous cards with theSystem Star-Hub Timestamp With the help The timestamp function of multiple sys- writes the time positions of tem star-hubs it the trigger events in an extra is possible to memory. The timestamps are link up to 17 relative to the start of record- system phase ing, a defined zero time, ex- synchronous ternally synchronized to a radio clock, an IRIG-B a GPS receiver. with each oth- Using the external synchronization gives a precise time relation for er. Each system can then contain up to 16 cards (master only 15). acquisitions of systems on different locations. In total 271 cards can be used fully synchronously in a bunch of systems. One master system distributes clock and trigger signal to all connected slave systems. External clock I/O Using a dedicated connector a sampling clock can be fed in from an external system. It’s also possible to output the internally used sampling clock to synchronise external equipment to this clock. ABA mode The ABA mode com- bines slow continuous data recording with fast acquisition on trigger events. The ABA mode works like a slow data logger combined with a fast digitizer. The exact position of the trigger events is stored as timestamps in an extra memory. Reference clock The option to use a precise external reference clock (typically 10 MHz) is nec- essary to synchronize the instrument for high-quality measurements with external equipment (like a signal source). It’s also possible to enhance the stability of the sampling clock in this way. The driver automatically generates the requested sampling clock from the fed in reference clock. Order Information The card is delivered with 256 MSample on-board memory and supports standard acquisition (Scope), FIFO acquisition (streaming), Multiple Recording, Gated Sampling, ABA mode and Timestamps. 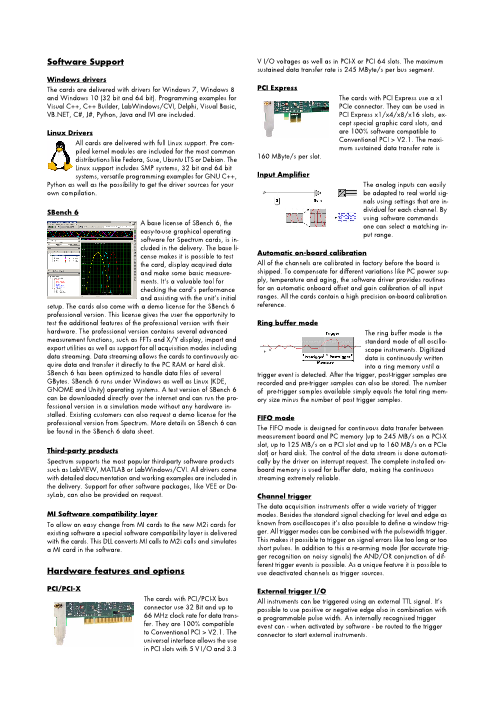 Operating system drivers for Windows/Linux 32 bit and 64 bit, examples for C/C++, LabVIEW (Windows), MATLAB (Windows and Linux), LabWindows/CVI, IVI, .NET, Delphi, Java, Python and a Base license of the oscilloscope software SBench 6 are included. Drivers for other 3rd party products like VEE or DASYLab may be available on request. Adapter cables are not included. Please order separately! . 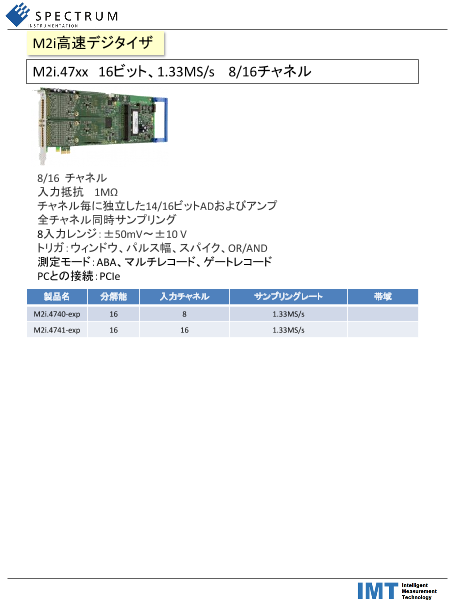 PCI Express (PCIe) PCI Express PCI/PCI-X Standard mem 1 channel 2 channels 4 channels 8 channels 16 channels PCI/PCI-X M2i.4710-exp M2i.4710 256 MSample 100 kS/s 100 kS/s 100 kS/s 100 kS/s M2i.4711-exp M2i.4711 256 MSample 100 kS/s 100 kS/s 100 kS/s 100 kS/s 100 kS/s M2i.4720-exp M2i.4720 256 MSample 250 kS/s 250 kS/s 250 kS/s 250 kS/s M2i.4721-exp M2i.4721 256 MSample 250 kS/s 250 kS/s 250 kS/s 250 kS/s 250 kS/s M2i.4730-exp M2i.4730 256 MSample 500 kS/s 500 kS/s 500 kS/s 500 kS/s M2i.4731-exp M2i.4731 256 MSample 500 kS/s 500 kS/s 500 kS/s 500 kS/s 500 kS/s M2i.4740-exp M2i.4740 256 MSample 1.33 MS/s 1.33 MS/s 1.33 MS/s 1.33 MS/s M2i.4741-exp M2i.4741 256 MSample 1.33 MS/s 1.33 MS/s 1.33 MS/s 1.33 MS/s 1.33 MS/s Memory Order no. 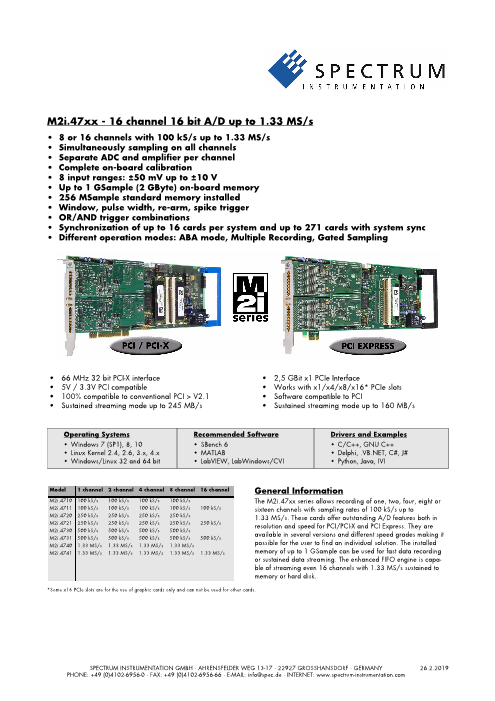 Option M2i.xxxx-512MS Memory upgrade to 512 MSample (1 GB) total memory M2i.xxxx-1GS Memory upgrade to 1 GSample (2 GB) total memory Options Order no. Option M2i.xxxx-SH5 (1) Synchronization Star-Hub for up to 5 cards, only 1 slot width M2i.xxxx-SH16 (1) Synchronization Star-Hub for up to 16 cards M2i.xxxx-SSHM (1) System-Star-Hub Master for up to 15 cards in the system and up to 17 systems, PCI 32 Bit card, sync cables and extra bracket for clock and trigger distribution included M2i.xxxx-SSHMe (1) System-Star-Hub Master for up to 15 cards in the system and up to 17 systems, PCI Express card, sync cables and extra bracket for clock and trigger distribution included M2i.xxxx-SSHS5 (1) System-Star-Hub Slave for 5 cards in one system, one slot width all sync cables + bracket included M2i.xxxx-SSHS16 (1) System-Star-Hub Slave for 16 cards in system, two slots width, all sync cables + bracket included M2i.xxxx-bxio Option BaseXIO: 8 digital I/O lines usable as asynchronous I/O, timestamp ref-clock and additional external trigger lines, additional bracket with 8 SMB connectors M2i-upgrade Upgrade for M2i.xxxx: later installation of option -M2i.xxxx-1GS, -SH5, -SH16 or -bxio Services Order no. Recal Recalibration at Spectrum incl. calibration protocol Cables Order no. for Connections Length to BNC male to BNC female to SMA male to SMA female to SMB female Analog Inputs 80 cm Cab-1m-9m-80 Cab-1m-9f-80 Cab-1m-3mA-80 Cab-1m-3fA-80 Cab-1m-3f-80 Analog Inputs 200 cm Cab-1m-9m-200 Cab-1m-9f-200 Cab-1m-3mA-200 Cab-1m-3fA-200 Cab-1m-3f-200 Probes (short) 5 cm Cab-1m-9f-5 Trigger/Clock I/O 80 cm Cab-3f-9m-80 Cab-3f-9f-80 Cab-3f-3mA-80 Cab-3f-3fA-80 Cab-3f-3f-80 Trigger/Clock I/O 200 cm Cab-3f-9m-200 Cab-3f-9f-200 Cab-3f-3mA-200 Cab-3f-3fA-200 Cab-3f-3f-200 Information The standard adapter cables are based on RG174 cables and have a nominal attenuation of 0.3 dB/m at 100 MHz. Software SBench6 Order no. SBench6 Base version included in delivery. Supports standard mode for one card. SBench6-Pro Professional version for one card: FIFO mode, export/import, calculation functions SBench6-Multi Option multiple cards: Needs SBench6-Pro. Handles multiple synchronized cards in one system. Volume Licenses Please ask Spectrum for details. Software Options Order no. SPc-RServer Remote Server Software Package - LAN remote access for M2i/M3i/M4i/M4x/M2p cards (1) : Just one of the options can be installed on a card at a time. (2) : Third party product with warranty differing from our export conditions. No volume rebate possible. Technical changes and printing errors possible SBench, digitizerNETBOX and generatorNETBOX are registered trademarks of Spectrum Instrumentation GmbH. Microsoft, Visual C++, Windows, Windows 98, Windows NT, Window 2000, Windows XP, Windows Vista, Windows 7, Windows 8 and Windows 10 are trademarks/registered trademarks of Microsoft Corporation. LabVIEW, DASYLab, Diadem and LabWindows/CVI are trademarks/registered trademarks of National Instruments Corporation. MATLAB is a trademark/registered trademark of The Mathworks, Inc. Delphi and C++Builder are trademarks/registered trademarks of Embarcadero Technologies, Inc. Keysight VEE, VEE Pro and VEE OneLab are trademarks/registered trademarks of Keysight Technologies, Inc. FlexPro is a registered trademark of Weisang GmbH & Co. KG. PCIe, PCI Express and PCI-X and PCI-SIG are trademarks of PCI-SIG. LXI is a registered trademark of the LXI Consortium. PICMG and CompactPCI are trademarks of the PCI Industrial Computation Manufacturers Group. Oracle and Java are registered trademarks of Oracle and/or its affiliates. Intel and Intel Xeon are trademarks or registered trademarks of Intel Corporation. AMD and Opteron are trademarks or registered trademarks of Advanced Micro Devices. NVIDIA, CUDA, GeForce, Quadro and Tesla are trademarks/registered trademarks of NVIDIA Corporation.